I spend more time on YouTube than I probably should. Most of the time I’m on the site, I’m tracking down strange and awesome music videos. But I also love cat videos (big surprise), ridiculous fake alien and UFO videos, videos of people behaving in incredibly unwise ways that are somehow not lethal to them, and pretty much anything that’s got Yackety Sax as its soundtrack. What do MRAs enjoy watching? As far as I can tell, when they’re not watching videos of other MRAs, or flooding the comments of feminist videos, they like watching videos of women getting punched. How else to explain the hundred-plus upvotes that greeted this brief video – it’s all of 15 seconds long –of a man knocking out a woman who was assaulting him. 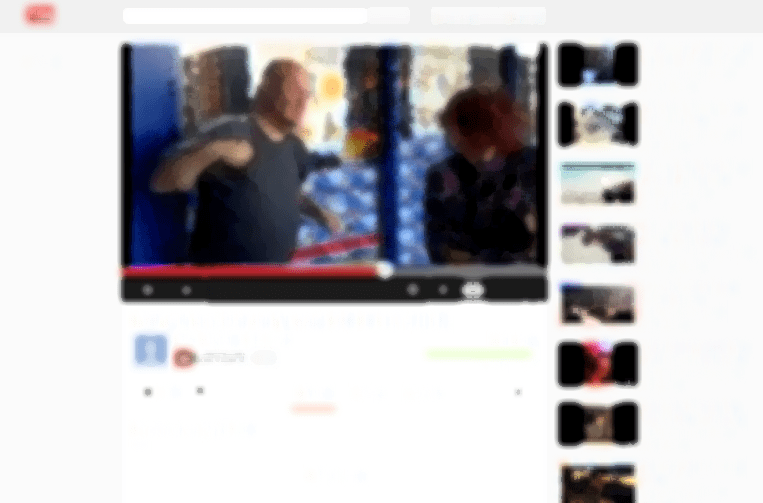 The video starts with a fight already in progress, as a woman rains blows on a much larger man backed up against a wall at what seems to be a strip mall while her friends shriek in the background. The man, after fending off a number of punches, hits her directly in the face and she drops to the ground. That’s it. That’s all we know. We don’t know who these people are, what the fight was about, or even who started it. But to the denizens of the Men’s Rights subreddit, this is a man who is fully justified in using violence against a woman, and they can barely conceal their excitement, posting dozens of comments proclaiming him a sort of Men’s Rights hero. Actually, the man in question isn’t particularly old, and he’s certainly not frail; he’s actually rather large and imposing. Evidently in that last comment Gus took it a little too far for his Men’s Rights bretheren, and he garnered himself a few downvotes. But the serious downvoting in the thread was reserved for those who questioned whether or not MRAs should be celebrating the incident captured on video as a grand victory for Men’s Rights. MRAs: If they can’t punch women, they don’t want to be a part of your revolution. Posted in: advocacy of violence, antifeminism, men who should not ever be with women ever, misogyny, MRA, reddit, why can't men punch women? Even Pelvic Tilt complained about the cover they did of I Kneed You. I am male. I WILL use force to defend myself against anyone, regardless of gender, regardless of age, regardless of religion, sexual orientation, political beliefs, etc etc etc. If you don’t like it, you’re probably to blame since you’re the same kind of PC person who will defend someone’s “right” to come grab my TV at 2 in the morning and will even praise them to do so, but at the same time would berate me for daring to protect my property. The guy wasn’t in the wrong here, he only resorted to violence after it was clear she wouldn’t leave him alone and he had to defend himself. It doesn’t excuse all of the MRAs jerking off to the idea that they might get to beat a woman in the future though. Women often have a sense of entitlement about violently assaulting men. I’ve experienced it first hand. Of course, once you hit back, they play the victim. Apparently, this guy has down syndrome according to one of the commentators of the video. Pretty sick. And today’s necromancer is Mike! Come on down and collect your prize! Or should that be come on up…from those catacombs. Oh and way to miss that the topic here was whether MRAs are assholes for the way they talk about hitting women, not whether the man in the video was justified. I don’t understand how necromancers can be so bad at reading for comprehension and yet perform the arcane rituals involved in raising the dead.